If you need to catch up… read Steps 1-6 and Steps 7-11. By Wednesday of event week, I had completed all my Gate and Perimeter shifts so I was finally free to go to Burning Man. 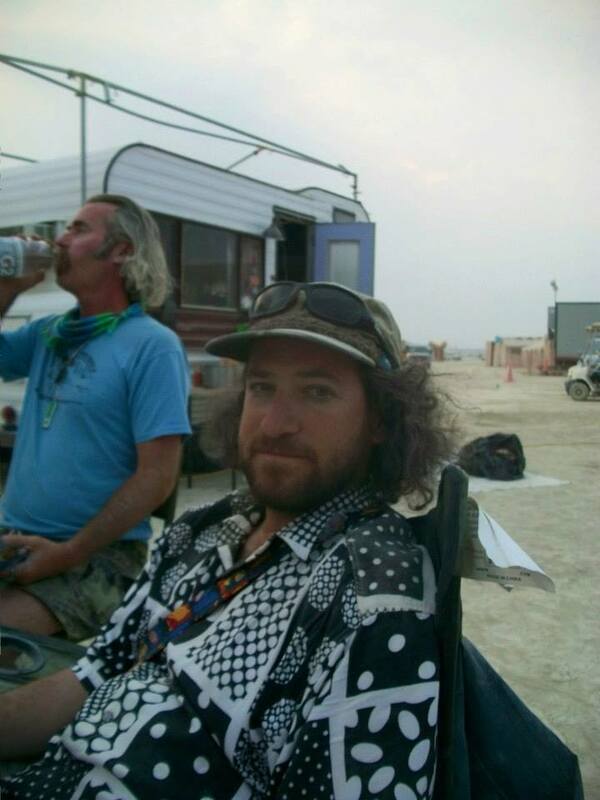 What that means is… even though I was already at Burning Man, I spent pretty all my time either working, recovering or just hanging in camp. I had not been out on the playa yet to see anything. 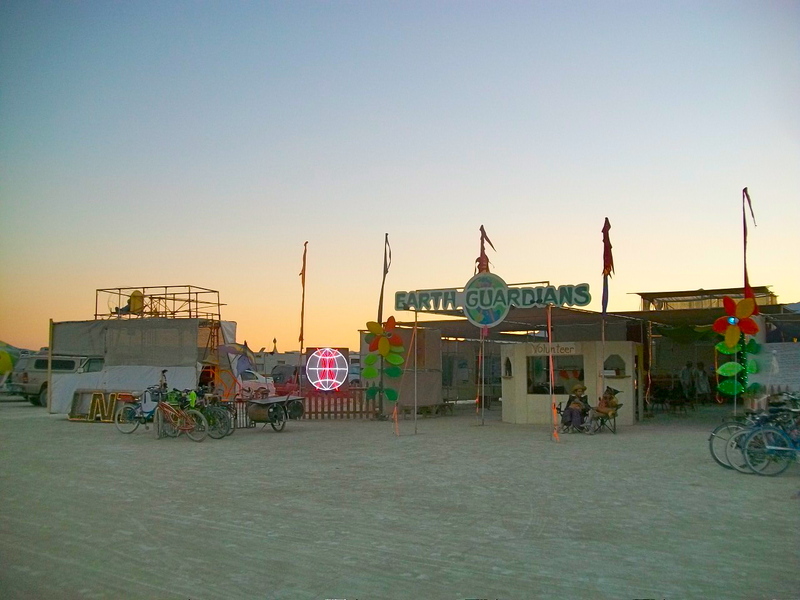 The advantage of camping with Earth Guardians is, we are right on Esplenade (it’s like beach-front) on the outer circle of Center Camp (downtown). 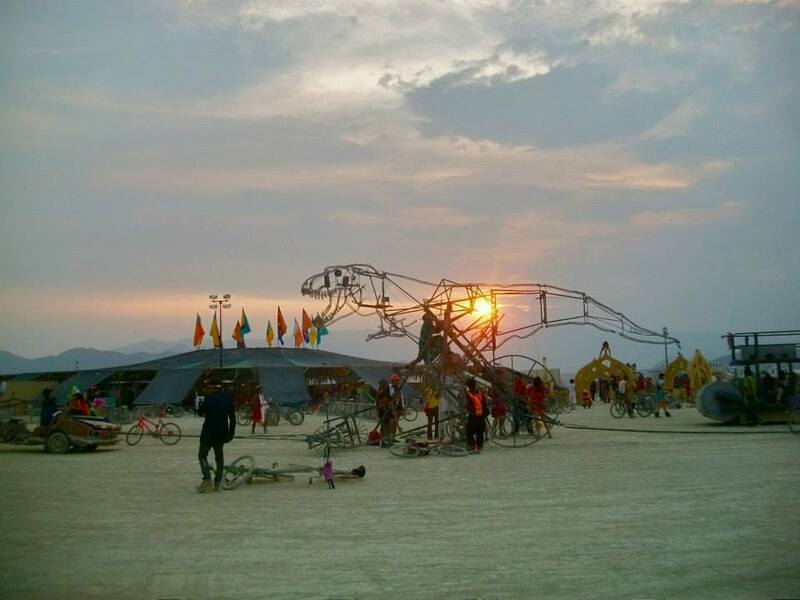 We have a killer view of the playa, the man and all the art car and pedestrian traffic. 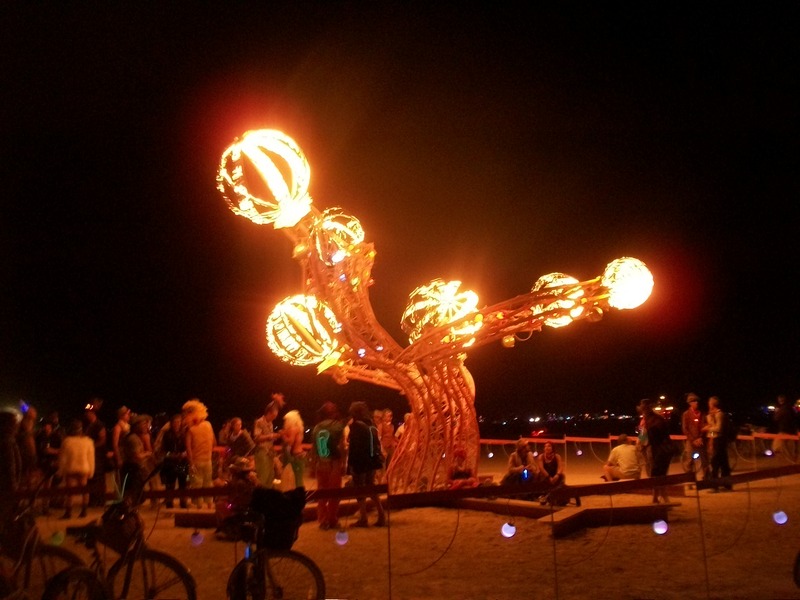 Basically, Burning Man comes to us, which does not motivate us to ever leave camp. 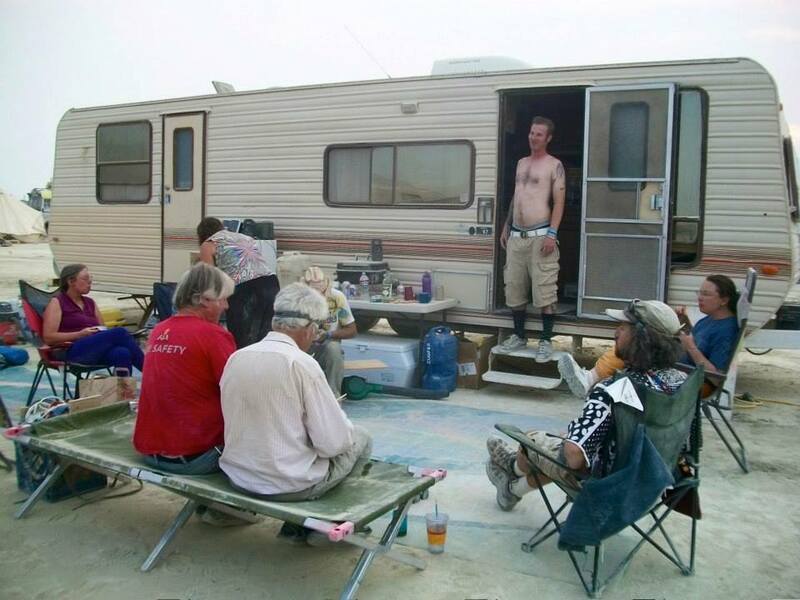 Eli and I had grand plans of cruising the playa with our bitchin’ art car, but once that plan died, we kind of lost ambition to get out. Because Eli spent all his prep time on the art car, he wasn’t able to prep his bike so he was bikeless. Getting around on foot is exhausting and limiting so stayed closed to camp. 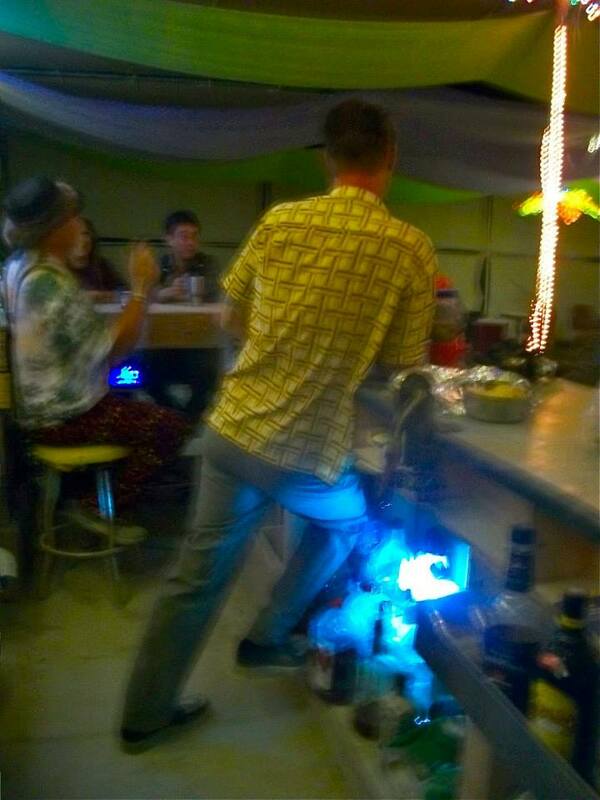 We also had multiple events in camp, which required a bar-tender so I spent a lot of time behind the bar. Our camp experienced some difficulties this year, which proved stressful to us all. 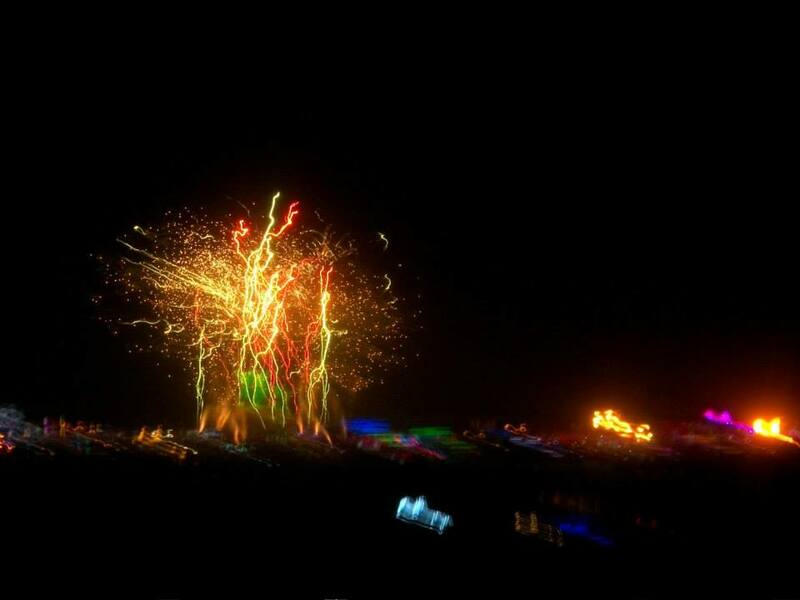 There is no such thing as a drama-free camp at Burning Man. Having Betty Dawn (our trailer) this year did make our burn so much easier. We had a cozy, private nearly dust-free space of our own. I was able to sleep in thanks to an illuminet shade structure and a fan over our bed. This also meant I didn’t get up early, so I missed opportunities to get out on playa early, before the heat of day set in. I got more sleep on playa this year, than ever before. I think that’s a good thing. 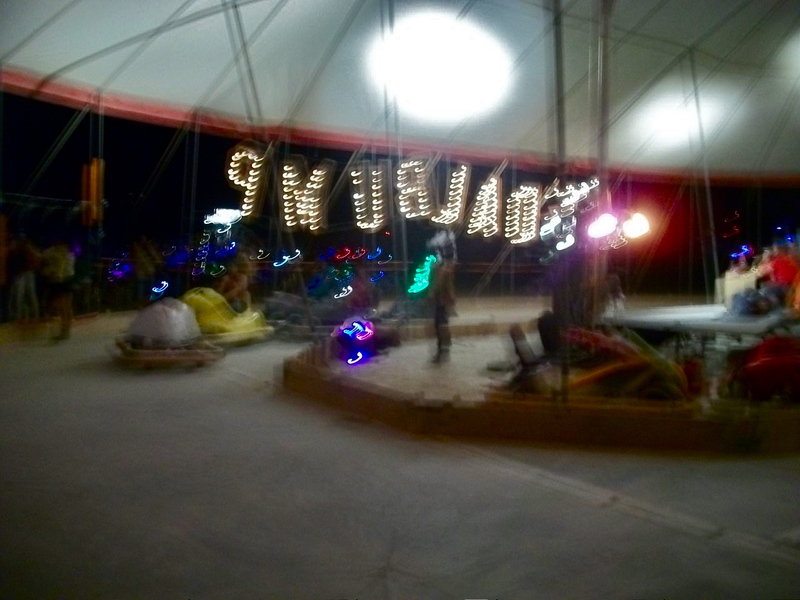 A couple of nights we did walk around our neighborhood, walked out to the Man and checked out art on the playa… allowing ourselves to be lead by blinky eye-candy. The playa was fuller than I’d ever seen it. Although this year had the biggest population (68,000), it didn’t feel crowded with people. It did feel full of new art though. In every direction was a sea of colorful LED lights, EL wire, lasers and moving radical illuminated art pieces. It was actually a bit overwhelming. 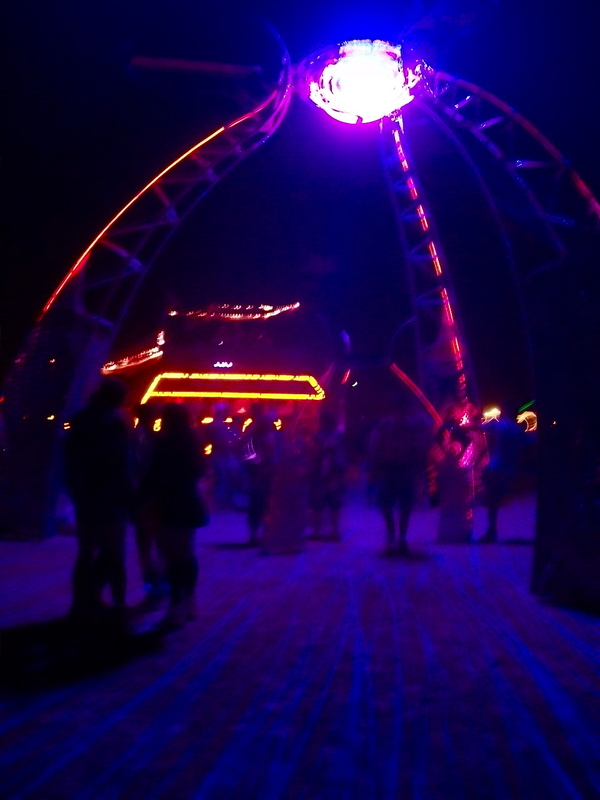 I think the coolest thing I saw on playa was an LED light piece that showered the ground with racing lights…it felt like the ground was moving. Center Camp had been our fallback for quick convenient entertainment, so we headed over to “see what was on TV”. I had a coffee-token so it was another excuse to go. 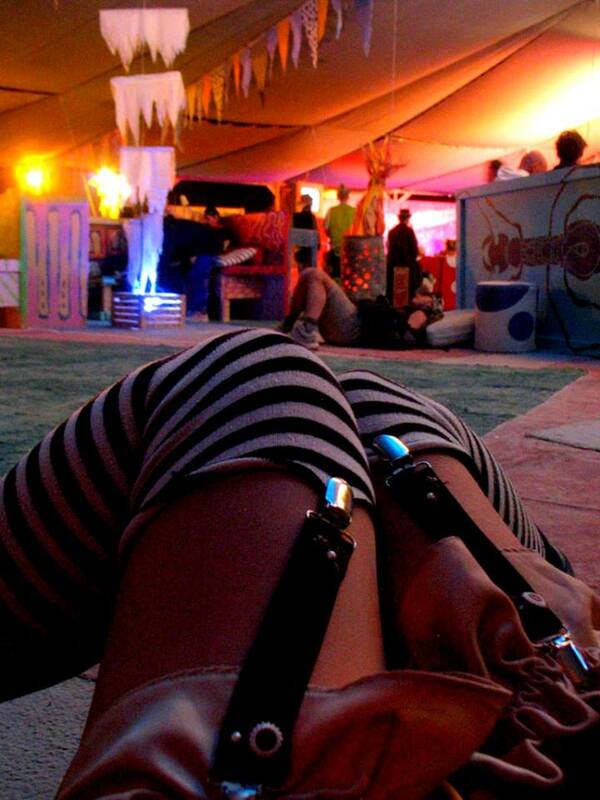 Last year we danced to an awesome live funk band there, then stumbled home to our camp close-by. This year Center Camp was set up differently. Instead of three stages, which created a 24-hour party, there was only one large stage… which sat empty when we visited. Center Camp was still full of people, but the vibe was different. It was quiet, subdued and allowed us to really focus on the art gallery there. We eventually snuggled up on some pillows and just people watched. It was a very different experience. It actually mirrored our own somber moods we had settled into. On Burn Night (Saturday), I sparked an on-air debate on BMIR radio. Tumbleweed was the DJ, allowed me invite burners into the studio to debate the allowance of feathers on playa. Click here for more details. We watched the burning of the Man with campmates Canyon and Damien from atop our parked art car that evening. It was lovely to watch from afar, and away from the other 68,000 hippies crowding around the Man. We spent the evening in camp at the bar. For Eli and I… this was the end of our burn. 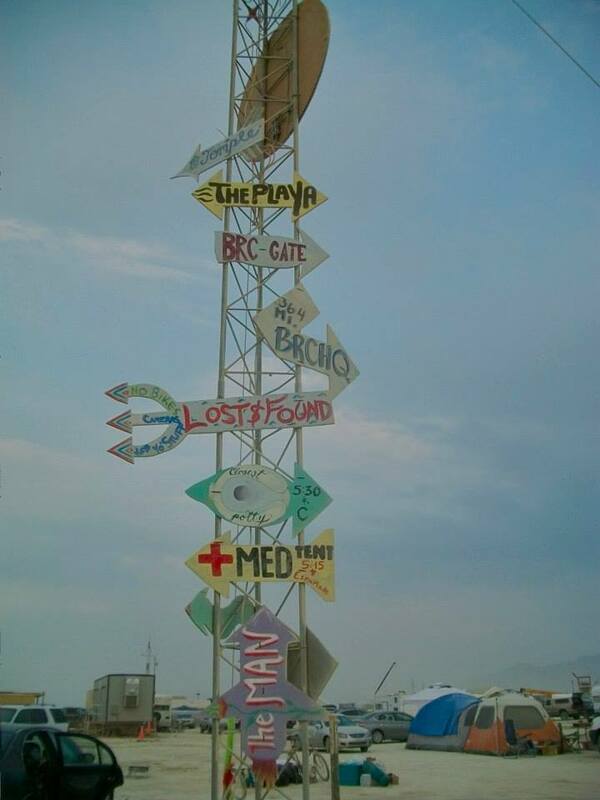 On Sunday Black Rock City begins to disappear. Overnight, art cars are disassembled, theme camps vanish and the city shrinks. For us, it’s all-hands on deck as we tear down the Pavillion and pack up camp. 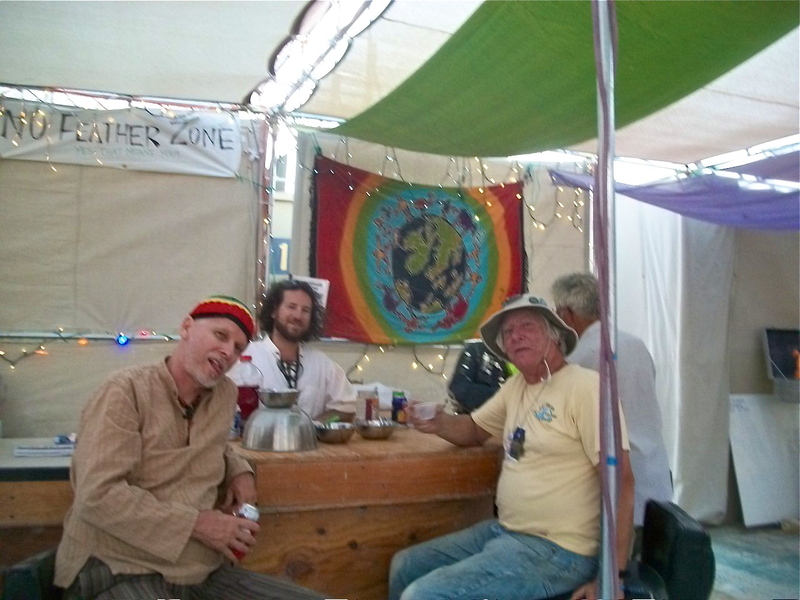 By afternoon, in a flurry of tools, poles, bins and ladders, Earth Guardians camp and our art car was broken down. By mid-afternoon Sunday, BMIR radios warned that a rain storm coming on Monday. 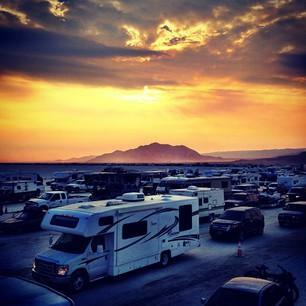 When it rains on the playa, the dust turns to cement and you can’t drive. 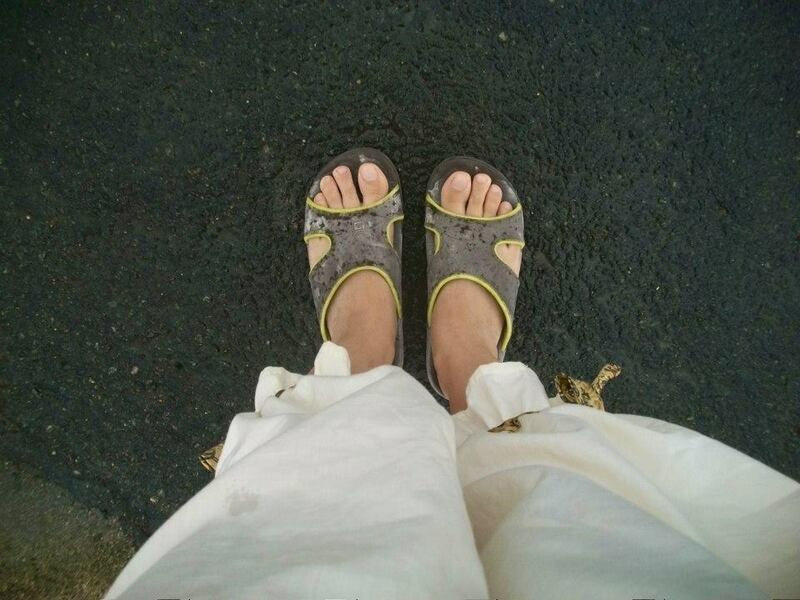 The Org was recommending that people consider an earlier departure to avoid getting caught in the mud. Although we had planned to stay until Tuesday, Eli and I were physically, mentally and emotionally spent. Our campmates, Cooper, Damien, Howie, Canyon and Cathy were planning to leave Sunday night, so that motivated us to pack it up. This meant we would miss the Temple Burn, but leaving before that burn was the best time to get out quickly. I made a pot of chili for our last supper with camp, which we enjoyed after packing up our personal gear. We were on target time-wise… when something unfortunate happened. As we jacked up Betty Dawn, her wheels sunk into the soft playa and caused her to to tip forward and land on her hitch. Grrr. Eli rallied the troups, got everyone to lean on Betty’s back end, tip her up while I got bricks under her hitch. We were losing precious time as thousands of burners headed to the gate. After a jump-start from Cooper, we were on our way out. BMIR radio warned us, as we headed towards the exit, that the wait was 6 hours and that folks should wait. We didn’t listen. Once we were in line, there was no going back. About an hour later, BMIR said the wait was now 7 hours and “why didn’t you listen to me?” Of course we laughed. Because we had two vehicles, it wasn’t easy to stay together in line but we managed to stay close. Every hour, the Exodus crew (part of Gate Crew) would pulse the traffic, meaning we were stopped while cars at the front moved up instead of inching forward for hours. This allowed us to turn off our engines and just chill. I edited my photos on my computer. When the line moved at the top of the hour, we’d drive for about 5 minutes, then stop for another hour. This does work, except for all the broken down cars on the road. One car’s driver had simply fallen asleep. We had to weave around them or risk missing the pulse for that hour. 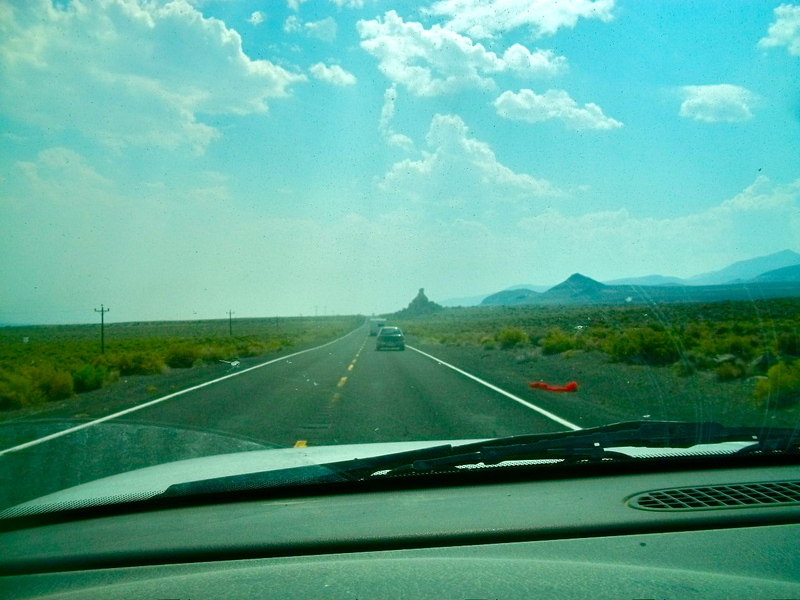 In the end, it took us 8 hours to drive the 12 miles from Black Rock City to Gerlach. We arrived at Cooper’s house at 5am. 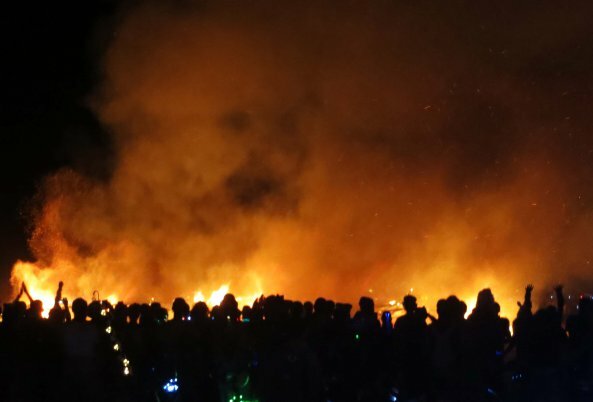 It was the longest Exodus I’d ever had, and it seemed a fitting end to a difficult burn. We started our decompression at Cooper’s with our campmates. I cooked. The boys cleaned. We got on line. Tuned in. Watched the news and rested. The line of cars coming off the playa never stopped. In fact, the line for gas station was lined up in front of the house, so Damien dished up the remainder of our dinner and served it to folks in line. We then began making grilled cheese sandwiches and quesadillas to serve up. We knew how long they had been waiting in that line. On Tuesday afternoon, the traffic died down so Eli and I caravan’d out with Canyon and Cathy. The heat of the day isn’t the best time to tow a trailer with a 12-year old truck with a bad radiator, so I drove with my heater on and my windows open. We got safely to Truckee within three hours, where I stopped to let Dusty cool down before the final climb over Brockway Summit. Arriving in Kings Beach was a breath of fresh mountain air. Lake Tahoe was beautiful and inviting. We began our own clean up, hosing off cars with vinegar, doing laundry and wiping down dusty cans of food. On Sunday, we rewarded ourselves by doing a float down Truckee River, Eli and his friend Nick in tubes and me in my kayak. It was lovely. I headed back to the East Bay on Monday, arriving just in time to pick up Dexter. I hadn’t seen Dex in nearly a month, so it was so nice to have my boy and to be home.